New software from Nanoscale.io aims to fill a gap in microservices middleware. Starting out as AnyPresence’s JustAPIs, the Nanoscale.io platform aims to help developers build microservices that can be plugged in front of on-premises legacy systems or function as a serverless service that can be deployed in containers. Nanoscale.io cofounder Richard Mendis says that he has seen the microservices ecosystem evolve over the past eighteen months, with the last six months, in particular, seeing a settling down of vendors in the marketplace. At one end, there are the API prototyping tools which help define and design APIs that will expose existing or new services and data assets (some of these are covered in my research report Serverless Architecture Products, and some are listed in Lawrence Hecht’s analysis of the serverless market). Then there are the deployment tools that help developers to manage DevOps tasks, containerization and orchestration, and continuous integration. Beyond that, there are API management vendors that handle API governance, authorization and identity management, rate limiting, and usage patterns. “Where there has not been a great level of maturity is in the middleware tools that build logic into the microservices,” said Mendis. He gives an example of developers using their IDE of choice to build an application and then putting the application into containers to deploy it. But that application will need to draw on a lot of business systems, often trapped in some back-end infrastructure, and developers end up replicating helper-services in each application: services like messaging, notifications, background jobs, parsing XML into JSON, and object storage. Mendis says this is the area that Nanoscale.io focuses on. It lets architects and developers build microservices and refactor APIs, and deploy them in the cloud through container orchestration layers like Kubernetes. The microservices are available to the developer teams who need them when building their applications. Unlike API prototyping architecture, the microservices middleware layer that Mendis is focused on does more than describe or build an API, it aims to build a microservices architecture that is platform-agnostic, so that developers can still use any IDE or set of deployment tools they like. Mendis says existing offerings of similar services — like Amazon Web Services, Google Cloud Platform, IBM OpenWhisk and Microsoft Azure — aren’t necessarily able to link to existing legacy systems, have separate costing for incorporating the helper services, and may tie developers into the vendor’s ecosystem. Like some other offerings, most notably LSQ, Dreamfactory and Restlet, Nanoscale.io’s microservices architecture builder can mix and match what on-premises and cloud services are connected in an application. Nanoscale.io also offers a cloud-based hosting service so that developers can manage their microservices from the cloud, and thus create a complete serverless application. 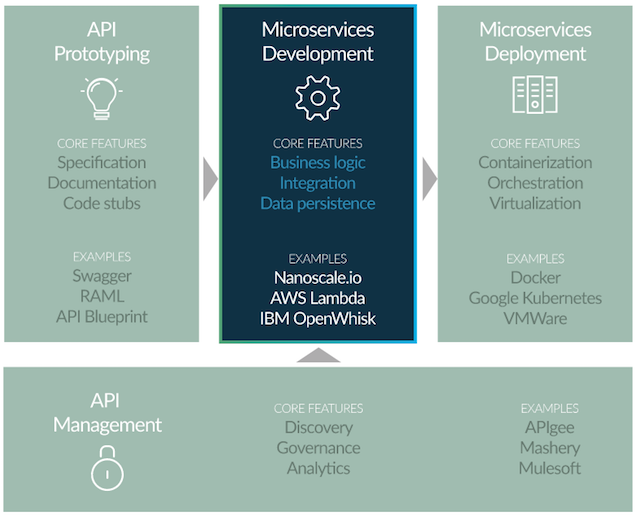 Mendis has most recently worked on an ecosystem map of microservices, serverless and container-related products to better demonstrate where they see themselves positioned (see the feature image at the top of this article). There are two particular competitive advantages that Nanoscale.io are keen to leverage. The first relates to the growth of the microservices paradigm. Mendis believes a tipping point has been reached where businesses of all sizes are considering how to reorient their architecture towards a microservices approach. While others have argued that you have to be a certain size to gain benefits from microservices, that argument may be changing with the emergence of serverless and the new opportunities for businesses of all sizes to stitch together functions in a cloud-based infrastructure to create new products and services. Even those businesses with private hosting providers or on-premises are looking to use microservices as their technical paradigm in any greenfields developments. So Nanoscale.io wants to be there when microservices becomes the priority for a business. On the other end of that spectrum, if a business is going down the cloud route and wants to have the flexibility of migrating deployment at a future point — to manage rapid growth within cost boundaries, or to meet particular server compliance issues such as storing government or HIPAA data — services like Nanoscale.io can be more cost-effective and future-proofed than being locked into some of the existing vendor offerings. The microservices that nanoscale.io creates are made to be migrated across instances. Mendis points out a developer could even create a microservice and run it from their laptop. The second advantage Nanoscale.io is focused on is edge computing use cases in the Internet of Things realm. The IoT is creating huge datasets, as each individual sensor in a smart infrastructure is collecting measurements in real-time. That data is often doing very little and is too expensive to send and store in the cloud. Nanoscale.io can be run as a binary on a small processor, meaning that it can be integrated into sensor firmware and be used as a gateway to make decisions on what data should be kept and stored and what data is only useful for measuring to make sure it falls within a current threshold level. Nanoscale.io’s use in this industrial IoT case would be to sit on a sensor or sensor gateway hub and trigger an action where the threshold was over a certain level and to identify and send whatever data should be kept for longer-term storage. The timing for nanoscale.io is crucial. By embedding itself in the core spine of the ecosystem map for microservices — connecting microservices, containers, API creation, and management — it is positioning themselves for the next wave of marketplace growth. This year, larger players have entered or expanded into the microservices and API space via acquisition (RedHat, Google and Deloitte), while other major players have continued building themselves into that spine (AWS in particular). In the next six months, this trend will increase as other tech companies seek to offer products that support developers working in this architecture paradigm, and as cloud vendors continue to move towards turning serverless platforms into a fully-fledged product category. 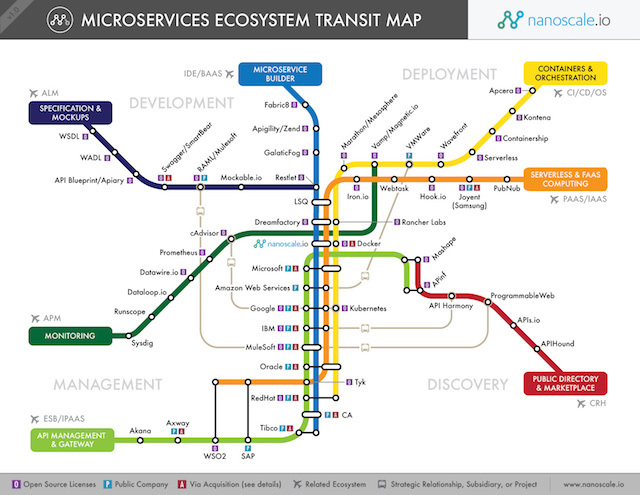 Feature Image: Nanoscale.io’s microservices ecosystem map, used with permission.